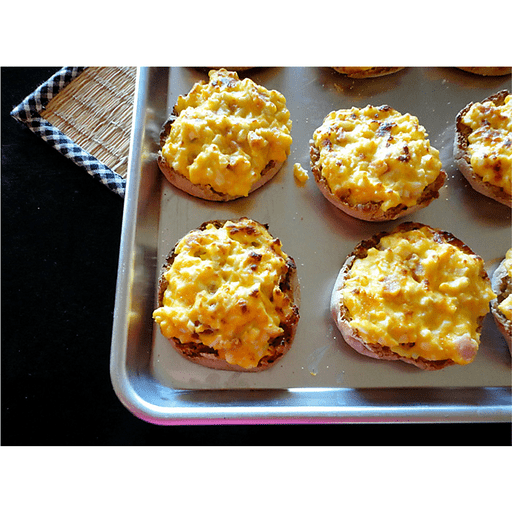 A creamy and delightful combination of chopped hard-boiled eggs, diced ham and cheddar cheese all atop a toasted English muffin. 1. In a medium bowl, combine chopped eggs with mayonnaise, yogurt, Dijon mustard, garlic powder, Worcestershire sauce, ham and cheddar cheese. Fold ingredients together gently. 1. Split English muffins in half, and spread egg mixture evenly on top of all 12 muffin halves. 1. Broil the muffin melts in the oven for about 4-6 minutes, or until hot and bubbly and starting to brown on top. Calories 170, Total Fat 9g (Saturated 3g, Trans 0g), Cholesterol 140mg, Sodium 220mg, Total Carbohydrate 14g (Dietary Fiber 4g, Sugars 1g), Protein 11g, Vitamin A 4%, Vitamin C 0%, Calcium 20%, Iron 6% *Nutritional values are an approximation. Actual nutritional values may vary due to preparation techniques, variations related to suppliers, regional and seasonal differences, or rounding.